When I bite into a salted radish, I am instantly transported to the Hippodrome tent at Oktoberfest. Advertised as the world’s largest fair, Oktoberfest in Munich, Germany draws more than six million people from mid-September to early October every year. This year is the 200th anniversary of Oktoberfest, and I suspect there could be record-breaking crowds. Several years ago husband and I journeyed to Munich with friends, but you certainly don’t need to be with a group to enjoy Oktoberfest. The picnic-style tables in each tent hold 20-30 people, so you’re likely to make quick friends with the person in lederhosen sitting next to you. 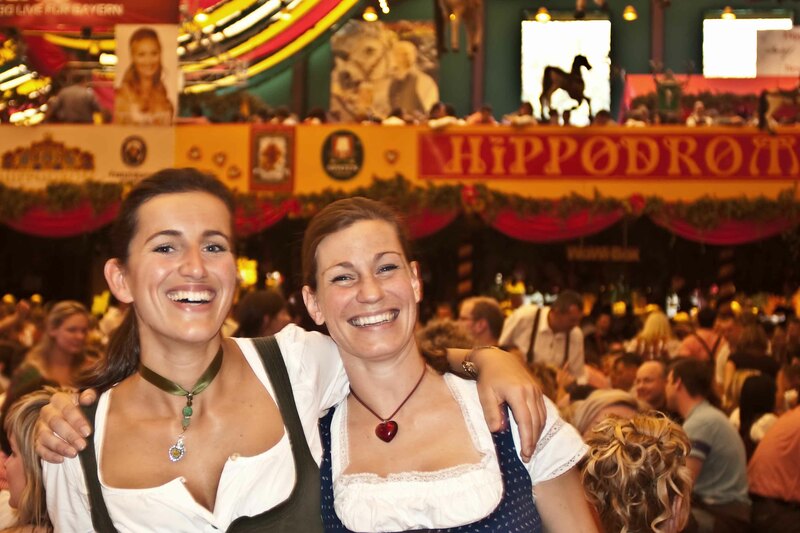 The benefit of being female in an Oktoberfest-going group is simple. Ladies can send the men to the fairgrounds early in the morning, which is what our group did. While reservations are preferred for groups, it’s still best to stand in line as the sun is rising to ensure you get the choice table once doors open to the tent. It’s the perfect job for men dreaming about their first liter, right? The men took an early morning train to the fairgrounds, but the ladies and I hailed a taxi to the site. The cheaper option is certainly public transportation, and you can check out this link for Oktoberfest-specific routes. When the ladies and I arrived on the grounds mid-morning, we headed to the Hippodrom tent where the men had claimed seats for us several hours before. It was opening day of Oktoberfest and there was a buzz in the air. The keg was scheduled to be tapped at noon, so a snacking smorgasboard of meats, cheeses and tiny radishes had been brought out on wood boards by our beer maidens. I had never eaten a radish dipped in salt, but the crunch, sting and fresh salt forever converted me. At 12:00 p.m. the ceremonies began. There were a few words spoken, singing, and then a famous German actor (we were told) tapped the keg in the Hippodrom. Oktoberfest was on. Prost! First, the liters of beer. Our beer maidens fit the stereotype. Young blonde women carried six to eight full liters of Spaten to each table. Not a serious beer drinker, I opted for a glass of sparking wine and sat back to watch the scene unfold. Prost! Clinking glasses. Laughter. The Germans knew how to throw a party. Not wanting to lose beer-sloshed patrons after one liter, our maidens immediately brought food to the table as soon as drinks were served. Pork knuckle was a favorite, along with roasted chicken, sausages and sauerkraut. Our table devoured every morsel. After many hours of beer, dancing, singing and a Boris Becker celebrity spotting, we moved on to the Kafer’s Wies’n-Schanke tent, one of the smaller tents on the fairgrounds known for its roasted duck and chicken. That’s right, more food. And singing. And a little dancing. Kafer’s is also known for celebrity sightings, but we did not spot anyone recognizable. When our group left Kafer’s later that evening it had grown dark and the grounds were aglow in amusement park lights. A large hill at the exit was sprinkled with lovers and men holding their heads. It had been a spectacular day. 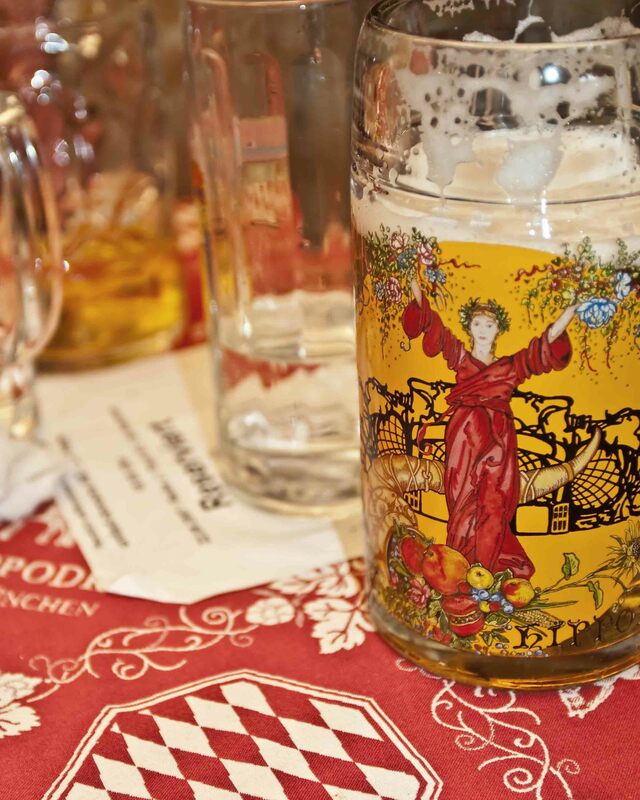 I chose not to drink more than a few glasses of wine and it never felt like I wasn’t part of the Oktoberfest experience. I hope to go back some day. 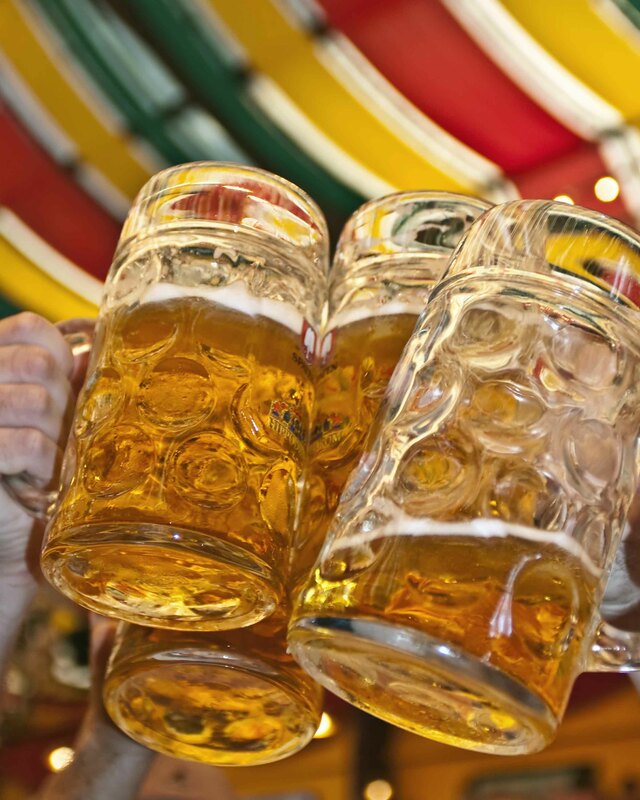 If you are attending Oktoberfest with friends, download the Wiesn app. It allows you to text, chat and find your friends on the fairgrounds via GPS! 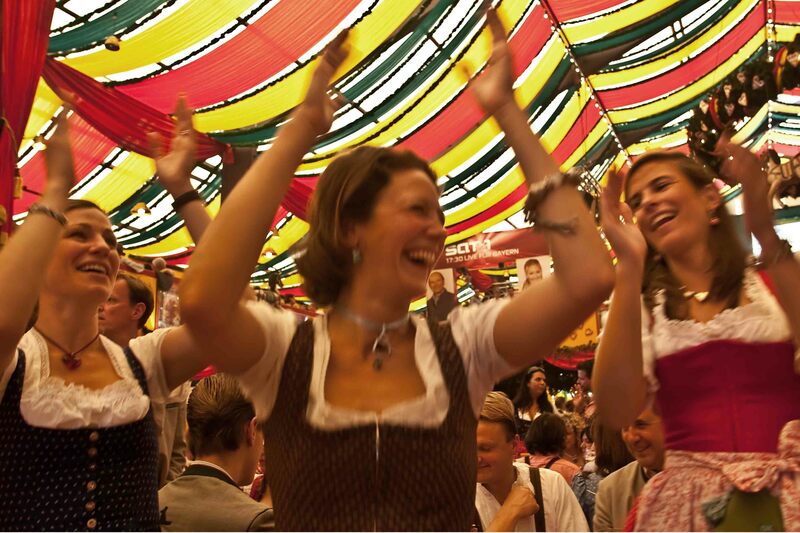 If you want to buy a traditional Bavarian costume for Oktoberfest, don’t be shy. A majority of people do wear a costume, especially the locals. Try your darnest to find a spot at the end of a table. It’s hard to move around when you are between eight people on your left, and eight people on your right. After that much food and beer, you will need to walk and use the toilet. It’s also an excuse to meet people sitting across from you. Treat your beer maidens well. They will withhold drink from anyone who is rude. 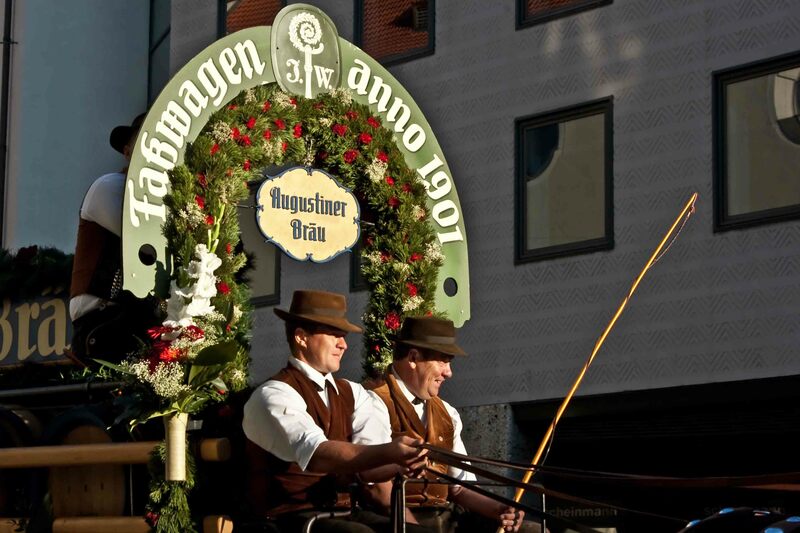 This entry was posted in Travel and tagged Fairgrounds, Germany, Hippodrom, Kafer’s Wies’n-Schanke, Munich, Oktoberfest, Paulaner, Spaten, Tent. Bookmark the permalink.